UNITED NATIONS, November 5 -- A resolution proposing a global moratorium on the death penalty was introduced at the United Nations last week, led by Italy. On November 2, the Italian NGO Community of Sant'Egidio, founded by Mario Marazziti, delivered to the President of the General Assembly, Srgjan Kerim, over five million signatures in support of a moratorium. 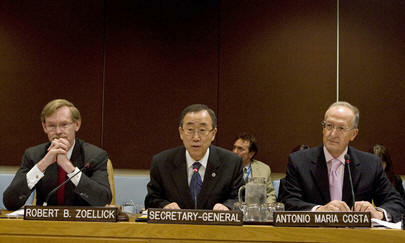 Inner City Press asked the spokesperson for Secretary-General Ban Ki-moon for his position, if he supports a moratorium. The spokesperson replied, "Well, right now the issue is in front of the General Assembly." At a press conference about the signatures, Inner City Press asked representatives of Amnesty International and of the Community of Sant'Egidio how they viewed Mr. Ban's position on the death penalty, including comparing it to that of his predecessor. Amnesty's Yvonne Terlingen noted that in Ban's first week -- first day, actually -- on the job as Secretary-General, he expressed a position on the death penalty far more ambiguous than that of Kofi Annan. She said that things got better after that; the representative of the Community of Sant'Egidio called Ban's position "increasingly strong," but still short of Annan's. Mr. Robert Zoellick participated in the CEB [United Nations System Chief Executives Board for Coordination] meeting, as I said last week. One of the focal issues at that meeting was the Secretary-General�s initiative on Africa MDGs. And as you know, the World Bank has been an active participant in that initiative. Mr. Zoellick came to Headquarters for the launching and he strongly expressed his commitment to fighting poverty and exclusion. As such, recent comments on Mr. Zoellick's commitment to the MDGs are the personal views of the Special Ambassador for the MDGs in Asia and the Pacific and do not reflect those of the UN or the Secretary-General. This sent correspondents, as least this one, searching back for the offending comments by the Special Ambassador for the MDGs in Asia and the Pacific. Sure enough, in Indian Express of October 26, envoy Erna Witoelar misspelled as Witoeler was quoted that " As leadership changes hands in IFIs, so do strategies. For instance, former World Bank President Wolfensohn was more pro-poor than current President Robert Zoellick." A week later, Ban's spokesperson rose to Zoellick's defense. One can only imagine the back story to this -- for now. Watch this site.